The Nike Pitch Team Football is perfect for training scenarios, and designed for use on both grass and astro surfaces. Featuring TPU casing, and a reinforced rubber bladder, it offers continued durability and shape retention making it an ideal choice for training sessions over time. The pentagon shaped 12 panel casing provide improved flight, greater control and overall performance. 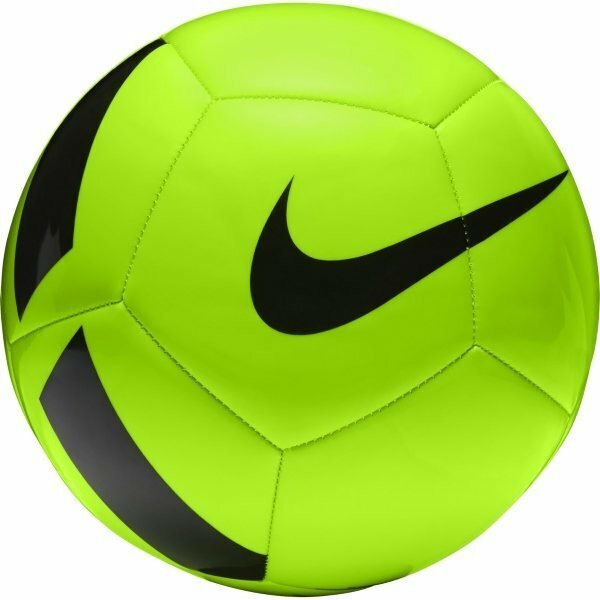 Featuring the iconic Nike Swoosh logo on both sides of the ball, and touchline flash graphics on the outer casing, the appealing design is stocked in different colourways which include White, Green, Yellow and Orange making this the perfect choice for optimum visibility in all weather-types! We stock sizes 3,4 and 5. Proven performance. TPU casing for durability. Durable casing. Reinforced rubber. Material: 60% rubber/15% polyurethane/13% polyester/12% EVA.